Bet 365 Vegas has stepped up the entertainment stakes this month with the uber-cool release of two new flashy mobile slot games. With the timely addition of Sparks Touch / Sparks App and Magic Portals Touch to its live show-reel, they’re already caused a stir and are fast becoming the hottest new additions to the site's hall of mobile fame. 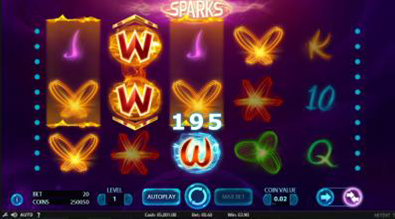 Sparks Touch and the Sparks App manage to boast 5-reel, 3-rows and 20-lines of electrifying video slot magic. Crafted to technical perfection by Net Ent, the reels are fully-loaded with an energetic collection of neon-themed graphics and symbols, as well as mesmerizing sounds and flashy features. Firstly you’ll have the uber-cool option to play in two modes, to Win One Way or Win Both Ways. The reels are also teeming with Wild substitutions and fully–charged Expanding Cloning Wild features! The slot offers all the ingredients and winning features for a captivating and sparky adventure to sizzling riches! Magic Portals Touch transports you on an epic 5-reel, 3-row and 25 line video slot adventure, past spellbinding wizards and warlocks, to uncover a wealth of mystical cashback rewards. The game boasts two Magic Portals that can actually transform identical symbols into wild symbols and trigger Free Spins to spell even more wild wins. One of the magnetic charms of this game is that there is a colossal 64,000 coins up for grabs, so it’s well worth diving feet first through this unique and fun-packed magical experience to hunt down its jackpot riches! You can check the Bet365 Vegas site for all the latest collection of hot games and promotions!